The main objective of writing this book is that every student should be able to acquire necessary skills required to become a programmer. The logic of each and every problem is explained in a simple manner which helps the student to write better programs. 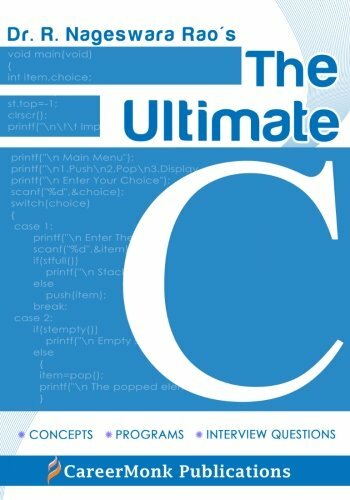 This book discusses all concepts of C starting from fundamentals to advanced topics in a lucid manner. It covers hundreds of solved programs which are useful to the students for their examinations. It also covers the interview questions which help the students come up with flying colors in their career. All the concepts are discussed in a lucid, easy to understand manner. A reader without any basic knowledge in computer s can comfortably follow this book. Helps to build logic in the students which becomes stepping stone for programming. Interview questions collected from the actual interviews of various Software companies will help the students to be successful in their campus interviews. Hundreds of solved programs help the students of Indian Universities do well in their examinations like B.C.A, B.Sc, M.Sc, M.C.A, B.E, B.Tech, M.Tech, etc. Works like a handy reference to the Software professionals in their programming. Starting at basic level, this book covers advanced topics like Pointers, Data structures, Searching and sorting techniques and Graphics. Buy the book The Ultimate C: Concepts, Programs and Interview Questions from Ideakart.com.